Below you can find driving directions from Google Maps to help you get from Key Biscayne Village to your nearest Fix Apple Now store, situated in Hallandale. You can either copy the driving instructions below or click here for a larger map and driving directions. At Fix Apple Now, we have the experience and expertise needed to solve a host of problems with your Apple devices in Key Biscayne Village. Whether you need to fix your iPad, iPod, iPhone 4,5 or 6, iMac or Mac Mini, we can deliver the first-class service that you're looking for. We have been in the business for many years and have helped scores of local Apple device owners to get the fix they were looking for. We know how much our customers treasure their devices, which is why we always aim to get right to the root of the problem and return them to them within a matter of days. 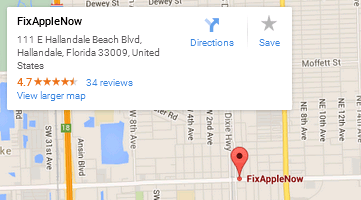 Talk to Fix Apple Now if you've been looking for an exceptional Apple repair service in Key Biscayne Villages. We can help you whether you've got a broken screen, cannot switch your device on or off, can't turn on your Bluetooth or are facing any other common problem with an Apple device. Why not get in touch today to learn more?